Thread: Low budget, instant time machine build. 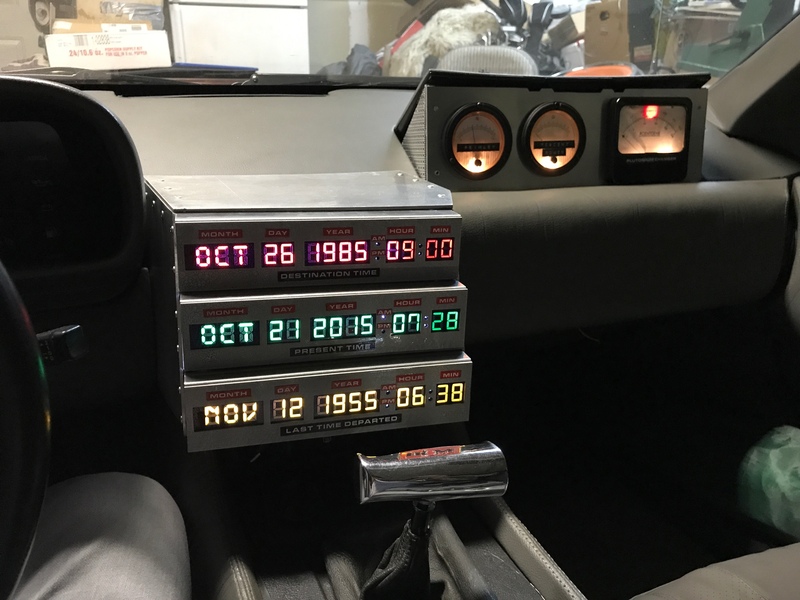 There are some of us who love a DeLorean as it is, unmolested, original, unencumbered. Then there are those who love the modded D, that's lowered, bigger engine, different rims, and maybe a spoiler to boot. And I'd guess there's lots of owners who of course love the time machine, some who just appreciate it, and some who want one. There are those of us who can afford to have two cars, one converted, one not. And then there are those who either do a full conversion themselves with the budget they have, the tools, and part they can find or make from scratch. Or those who have liquid cash, and pay $45k or more for a conversion. I'm one who loves the look of my car modded stock (lowered, spoiler, 350 V , as do tons of other people. But then I love the time machine, but can't bring myself to all the wiring, drilling, and so on. 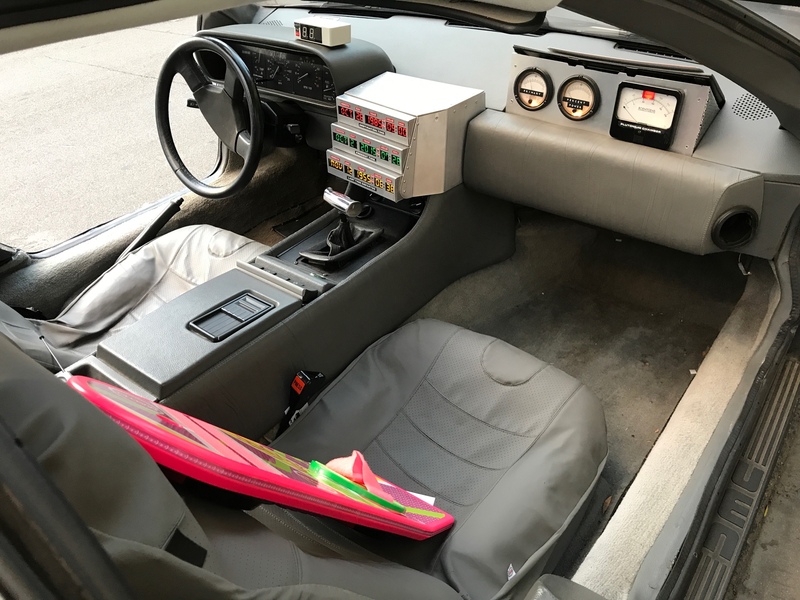 Plus I don't want to spend hundreds of dollars for parts I can design and print (like the wormhole emitter), or build to being screen accurate enough - the TCD for instance in the replicas are programmable like in the movies, but the movie version was all smoke and mirrors, and mostly a static prop. So I'm attempting to use my prop design and building skills and what I learned from building my replica R2D2 to keep this low budget but realistic, and quick change to go from normal to BTTF. I've modeled to scale the wormhole emitter in 3D, ready for printing, and the flux boxes are on Thingiverse. Those can be mounted when needed using the 3M hanging tape quickly for an event or parade, or Con, and taken off with no damage to the stainless. 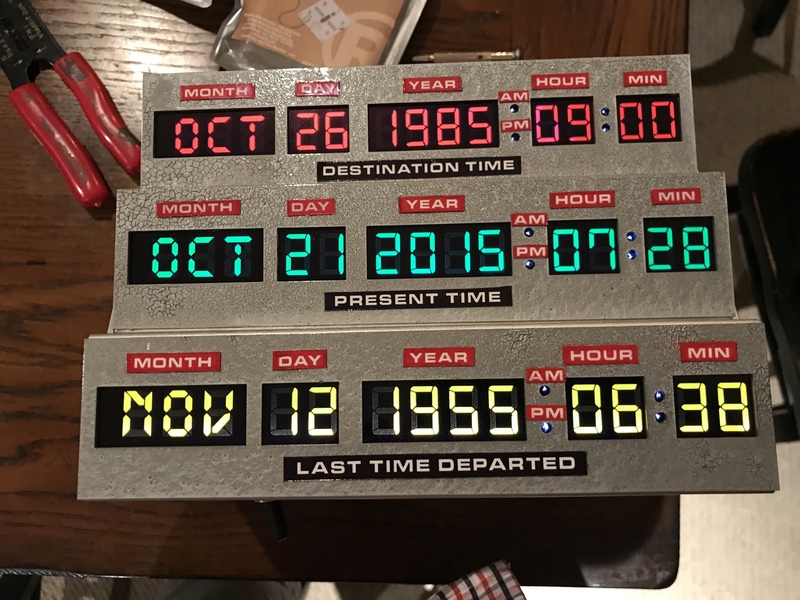 And I've finished the time circuits display and plutonium gauges pod too. Neither are interactive- they're static and just light up. The gauges use battery powered LED string lights, and the TCD uses colored printed gels, backlit by LED strips and eight AA batteries with a hidden switch. Both go in and come out of the car easily. And my Mr. Fusion is a converted Krups, and sticks onto my louvres with black Velcro, and lights up inside as well. Eventually I'll print out the base for it. And of course tons of thanks to Mark, Bruce Coluombe (sp? ), and everyone on the time machine build thread! Some pics of the final pieces, and I'll post more on the build progress here. Neat idea. love to see more of it. Will designs n whatnot be available for other folks to do a similar non destructive thing? I'll be posting more here on the step by step of each piece- well, what I remembered to photograph during the process, along with what I used. 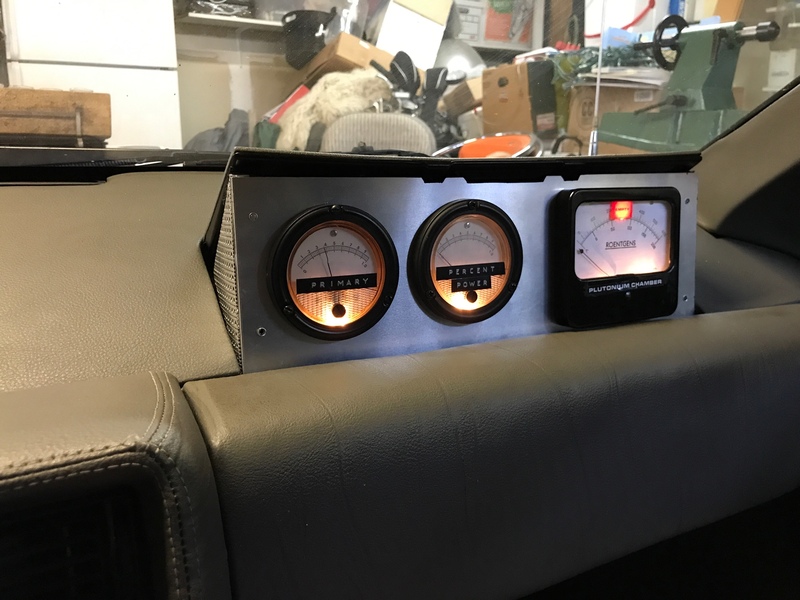 The metal plate for the gauges came from Bruce, as well as a one-off TCD box he had made as a prototype, but looking at those, they look like they'd be easy enough to make if you have the tools or can get someone to cut the metal for you. The metal for the sides of the gauge cluster was just aluminum that came close enough to the real thing that I got from a local hardware store. I then made a 5 inch triangle template with flanges, drew it on the metal with a sharpie, and cut with pair of tin snips. I then bent the flanges into place using a metal straight edge to help bend them by hand. I then glued the triangles on with silicon glue and some small clamps until it cured. And I believe there's an online time machine Builders group somewhere- maybe Facebook? I think though that this hobby needs to have the same friendliness and help that the R2 Builders group has, personally. Looks nice...need a vacuum? just askin...hehe.